Greg Van Avermaet will start his 2019 season at the Volta a la Comunitat Valenciana. 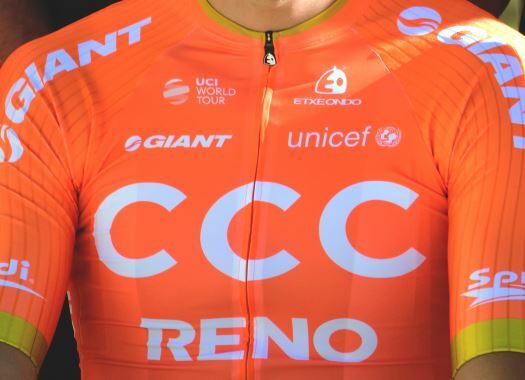 The Olympic champion will wear the CCC Team's colours for the first time in the Spanish race. The team will line-up for the five-day race with a strong roster that will mainly fight for stage victories. "After the fantastic start for our team at the Santos Tour Down Under, we're heading to our first race in Europe with a great group of riders around Greg Van Avermaet," said sports director Piotr Wadecki. "Everyone is very motivated to get their season underway and we want to continue the team's early success in Spain. "We're heading to the race from our final training camp and for the guys lining up here, I think it has been important that they have all been able to train as a group especially as many of them have never raced together. Everyone has been able to get to know one another more and they have been putting in some good efforts which I think will really help us going into the race. I am confident that we will be able to make a nice result next week." Van Avermaet is looking forward for the start of his season in a familiar race, as he had already been there in 2017 and 2018. "This race is a great way to kick off the season," the rider commented. "It's close to where we have our training camps and this last one leads perfectly into the race. This year there will be a lot of firsts for me here and that's exciting. It will be the first time racing as CCC Team, the first time I race on my new Giant bike and in my Etxeondo clothing and finally, it will be the first time I race with some of my new teammates. "There are some riders in this group who will play a part in my Classics campaign and as we are new to one another, it will be good to see how everyone reacts when we move from training together to racing together. I think it is important to have the confidence of all of the riders going into a race and before the Classics start it will be good to learn more about each other. This will be the perfect exercise for us all."